Summary: Bit of a slow week as Golf never showed up, Baw only worked 2½ days because Golf didn't pay him, and Houa had commitments on our neighbor's boat for a few days. Our big accomplishment was laying 2 strips of biaxial glass down the entire length of both hulls, to bond the joint‑lines from the outside. To do this, Jon had to grind off the old antifouling and gelcoat from 4 places where supports had been placed to make sure Ocelot didn't fall over (Ocelot sits happily on her keels and needs no other support). Jon also sanded many other areas of the hull to smooth them down a bit, and he spent more time polishing the mast. Sue did a lot of sanding and paint stripping on the mast and was able to apply Nyalic to finish the area between the first and second spreaders. 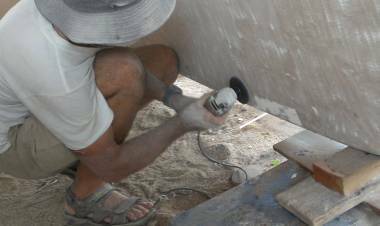 Jon drilled the holes for the deck‑fills for our new forward tanks and de‑cored them so Houa could fill in where the balsa was with epoxy mud. 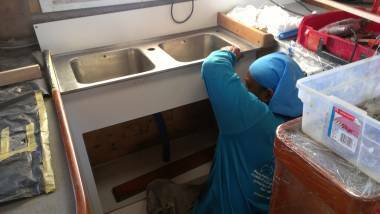 Houa worked all week on the sink cabinet in the galley, which is more complicated than any of us realized. Baw spread gelcoat filler and sanded it smooth on the underside of the bimini. Thursday was our Thanksgiving and Sue prepared a sumptuous feast (with only a microwave) which we shared with our Aussi neighbors. We talked to another contractor to get prices for finishing the antiskid and gelcoat on the decks, since Golf isn't answering his phone. A somewhat strange and slow start to the week, but there is change in the air, and we are still sorting things out. Both Jon and Sue put in a good day's work, and it felt nicely nostalgic of our many years of cruising together, just the two of us, doing all our own work at haul outs! 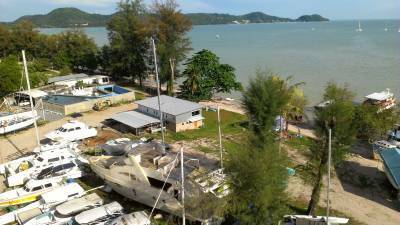 Houa had commitments on our neighbor's boat to finish some interior gelcoating and woodwork. Jon talked to Houa and although Golf told Houa to work on Ocelot, Jon released him to work on our neighbor's boat for the day. Baw, we have learned, got fed up with Golf's irregular payments, so has left team Golf to work directly for the yard, or more specifically, under Cris/Num, the yard manager. We hope to have him back soon. 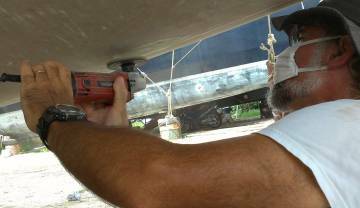 Jon started out the day attacking the 4 small patches of antifouling that were left on the hull where the supports were originally. 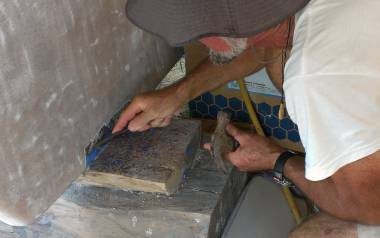 He used a chisel to chip off the old (soft) paint, then went to work with a grinder and a sanding disk on the underlying gelcoat. In the spirit of research, he then carried on sanding the bottom smooth, getting rid of the bumps of gelcoat and thick resin. By smoothing out the hull, we'll save a lot of time and money on workers and phenolic (non‑water‑absorbing) micro‑balloon filler when we fair the hull. He certainly didn't finish the smoothing job, but got a good start on it, and now has a better idea of what the system will be. Sue spent an extra hour at the apartment finalizing more paperwork and financial stuff. And then since it was the height of the morning (read HOT) she caught a 40 baht ($1.30) motor scooter taxi for a ride straight to the yard. Sue spent the morning fine sanding and prepping more of the mast, and after lunch managed to apply Nyalic to another 8' (2.5m) or so of the middle section of the mast, under the threat of dark clouds to windward. Thank goodness the rain bypassed us. 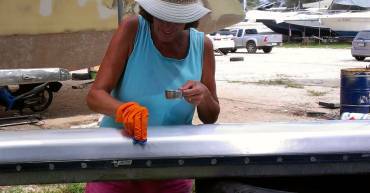 With the sun hot on the aluminum, the mast is quite warm and the Nyalic was dry to the touch within 10 minutes. It is really easy to work with, as it blends in so well. We used a degreaser and then an abundant fresh water rinse. 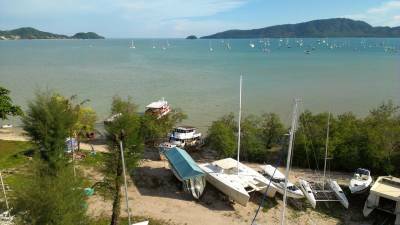 Once the mast dried (not long in the tropics! ), we applied denatured alcohol. Then the Nyalic could just be wiped on with a lint‑free rag, and the line between the old and new applications was invisible. Nyalic is amazing! At least so far. We'll see how it holds up in future! 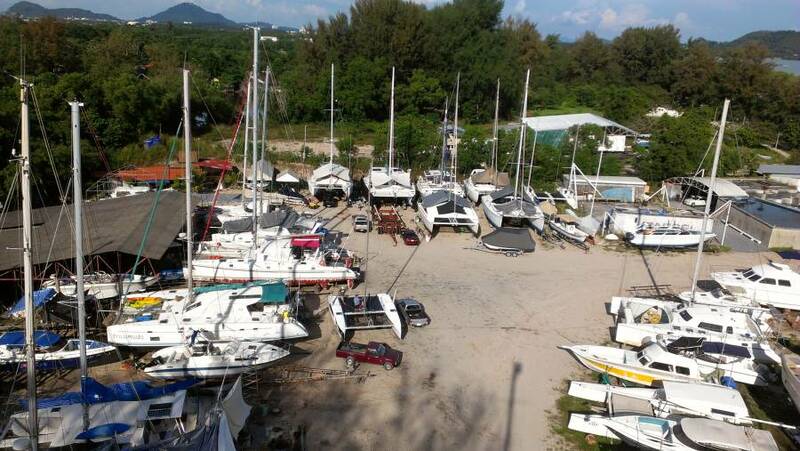 Not a bad day on Ocelot, as our little team of Jon, Sue and Houa made some noticeable progress. The best news of the day was that Baw finished his short‑term work for the yard and sought us out for more work. We checked it out with Cris/Num, the yard manager, as we don't want to step on any toes. All is cool, and Baw will start working for us (not Golf) tomorrow. We told him he would be paid, in full, each Saturday for work from 8:30‑5, and we will give no advances. He seemed happy with that, so tomorrow he will continue with the gelcoating on the bimini using the cheap local gelcoat, but now we know that we can cover it later with the better, more colorfast and water resistant ISO‑2500 gelcoat. Inside, Houa worked on the galley sink cabinet, fitting and fiddling with the cabinet front which is teak inside and white Formica outside, although very little of that white will show. It will be more like an accent. Jon thought it should be turned around, to have the Formica inside, but Sue is cool with it as is, and, well, it's her galley! The important thing is to get the sink level. The other trick was how to finish the inside back wall (we decided to leave the wall off, and just paint the bulkhead) and the two sides towards the back. These are areas we may want to get at some day, on starboard to access the sliding door for the companionway, and on port for gas lines and wires for the oven. 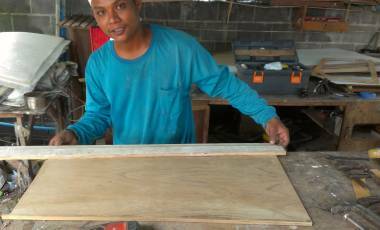 Houa will fit removable wood panels which will keep us from losing things, but allow us access. Jon gets the "snowman" award of the day. 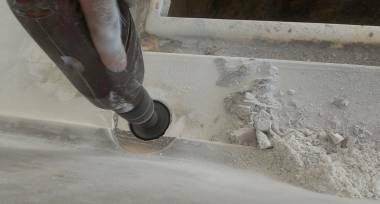 He spent hours and hours with the big orbital sander and the smaller but more powerful sanding grinder, smoothing the bottom of the hulls, and getting coated in white gelcoat and polyester dust. Yes, he wore glasses and a breath mask but his arms are like jelly. Ocelot was built in several molds, then the pieces were joined together. But Wauquiez only joined them on the inside, not the outside. This lets the joint‑line flex a bit, which cracks the gelcoat that covers the joint. We want to put a couple of layers of glass tape along the outside of the joint‑line under the hulls of the boat, to minimize flexing. Sue had a bit more fun playing with water and sandpaper out on the mast. In the morning she prepped the remaining 10' (3m) or so between the first and second spreaders. This is definitely a learning process to get all the steps right. Nyalic is far too expensive to muck about with possibly contaminated surfaces. So, first it was a wet sand with 1000 grit and a very dilute degreaser. Then she had to rinse well with drinking water(! ), not the water in the hose at the yard, as that left a residue as it dried! She could let the mast sun‑dry, but she had to hand dry the sail track which has a groove that holds water which would easily mess up the Nyalic. Once all was dry, it got wiped down with a clean cloth and denatured alcohol. Sue wore a latex household glove, but will have to try something else as the Nyalic eats through it, just like it did through the little polyethylene cup she and Amanda used last week. Now she uses a stainless steel measuring cup. Less than 80ml (about 2 tablespoons) was more than enough to cover those 10' (3m) when wiped on carefully with a lint‑free rag. 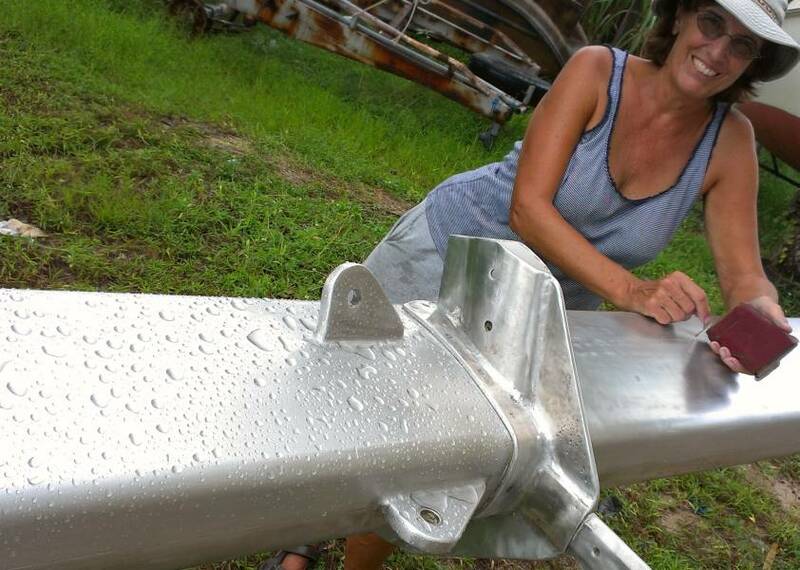 Sue's afternoon project was to wet sand another huge section of the mast, cleaning off the residue left by the polisher. Her fingers are throbbing from the sandpaper and her fingernails are down to the quick. Jon's arms are vibrating (when he can lift them at all). Such is work on Ocelot. The morning rain precluded doing the fiberglass work Jon was working on yesterday, so he worked on the new forward tanks, laying out and cutting the holes for the 2 deck‑fills. These fills used to be where the new hatches are now. Since there's no room on that bit of deck now that we've put the hatches in, the obvious place is inboard, next to the chain lockers. At first, we were going to put the fills above the chain lockers, but that would have required boring a hole through the bulkhead that separates the chain lockers from the new tank compartments. Not a big problem, but an additional 2" (5cm) hole to drill out, de‑core, and seal. 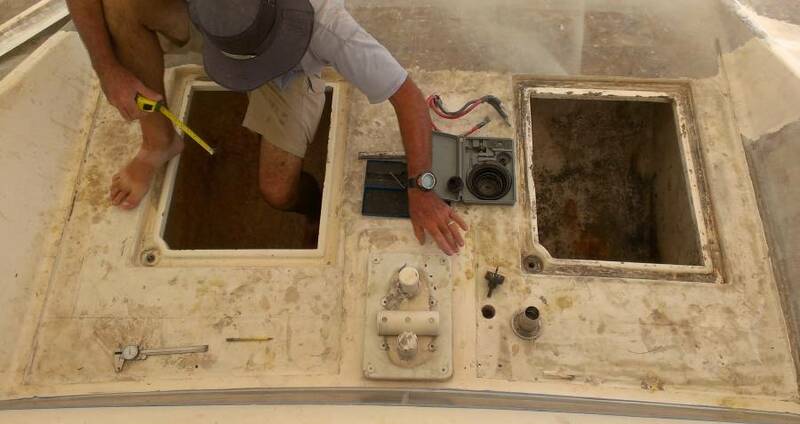 But closer inspection revealed that the bulkhead is actually far enough inboard that the fills could go next to the chain locker hatches, but they'd actually go down into the tank lockers. This would save us from drilling the 2 big holes through the bulkheads, and since we only have cheap Chinese hole‑saw sets that don't really cut fiberglass but only sort of wear their way through it, the fewer holes we have to drill the better. In the end it still took a fair amount of work just drilling down through the deck. The fiberglass on top is fairly thick, then some balsa coring (which the hole‑saw had a surprisingly hard time going through), and then a really thick layer of fiberglass. Lots of swearing at overheated drills but Jon got both holes drilled. Then he used a chisel and screwdriver to remove as much of the balsa coring as he could reach. Sometime soon we'll mix up some epoxy filler and push it into where the balsa was. Then we can drill the mounting holes and bed the fills in with silicone. Houa worked diligently on our galley sink cabinet again. We had some more discussions about accessing things behind and to the sides of the cabinet, so he will make the middle shelf able to move slightly so that we relatively large boat owner‑types can fit in the small spaces. Sue ground off more of her fingertips while sanding the mast. It is going to look so beautiful! Interestingly, the Nyalic must increase the surface tension of the water. After the morning rains the bare aluminum was dry, but the part with Nyalic had big stand‑up drops of water on it. Tomorrow, of course, is our Thanksgiving - possibly our favorite holiday as it's all about family and friends and food, and not commercialized much. We have no real kitchen at our apartment - just a microwave and a hot‑plate - but Sue is planning a nice roast‑chicken dinner to share with our (Aussi) neighbors. Forget the turkey this year: it's $8/lb or $4/kg here, way too expensive for us mere mortals. 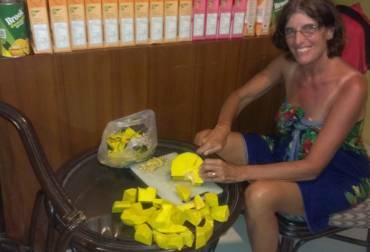 As I write this Sue is chopping up a pumpkin she bought at the market to make spicy-pumpkin desserts. Strangely, outside the US, pumpkin is ONLY a savory vegetable, never a dessert. And most Americans know little about eating pumpkins except that they come in cans, and they're only used for pumpkin pie. But we're sorry not to be able to share Thanksgiving with Chris or Amanda or the rest of our family this year. Thank goodness for Skype! Happy Thanksgiving to all our US folks! 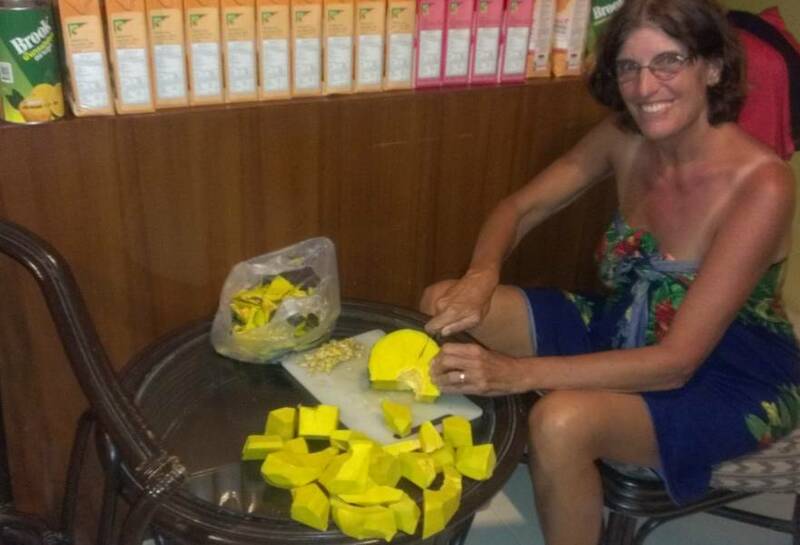 Sue stayed in the apartment today, preparing our Thanksgiving feast and then pampering herself with a $10/hour massage. 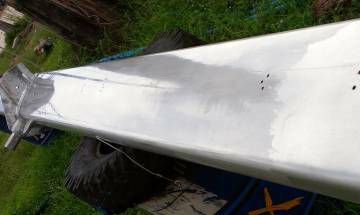 Baw was back and worked all day on the underside of the bimini, smearing out gelcoat filler and then sanding it smooth. He'll probably be at this for the next week or so. 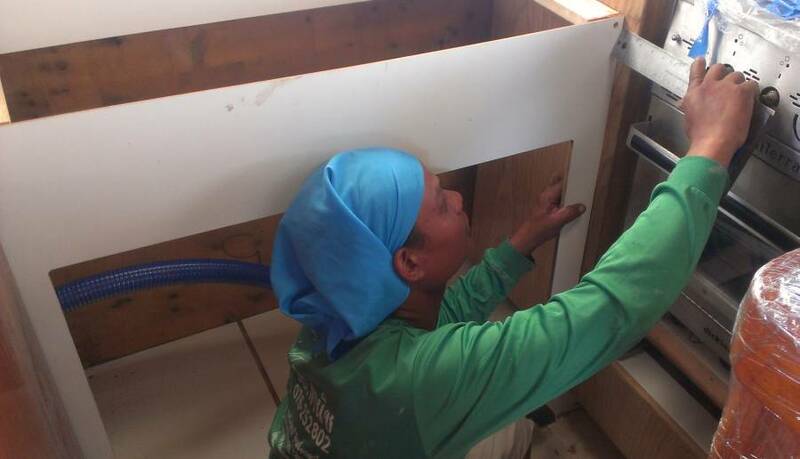 Houa spent the day building framing and supports for the galley sink. It's fiddly work and not much to show for the effort at the end of the day, but it's all necessary. But when Jon left the yard at about 5pm, Houa was mixing up some epoxy mud, so Jon asked him to make a bit extra and use it to fill where the balsa coring was under where the forward deck‑fills will go. Jon decided to attack the seam line where Ocelot's hulls are joined down each centerline. Wauquiez (the builder) only joined the hulls on the inside, but now that the gelcoat has been ground off, we can join the outsides as well, which should strengthen the hulls and prevent cracking. We don't have a lot of biaxial glass left, and we don't want to have to buy a whole new roll, so Jon carefully cut what he needed to put 2 overlapping strips down each hull. Then he wrapped the roll up in plastic and put it inside Ocelot, so nobody tries to "borrow" a bit of it. But by the time he was finished cutting all the fiberglass into strips, it was a bit too late to lay the glass, especially as he wanted to get home a bit early for Sue's Thanksgiving Feast. This Thanksgiving is a bit strange for us. 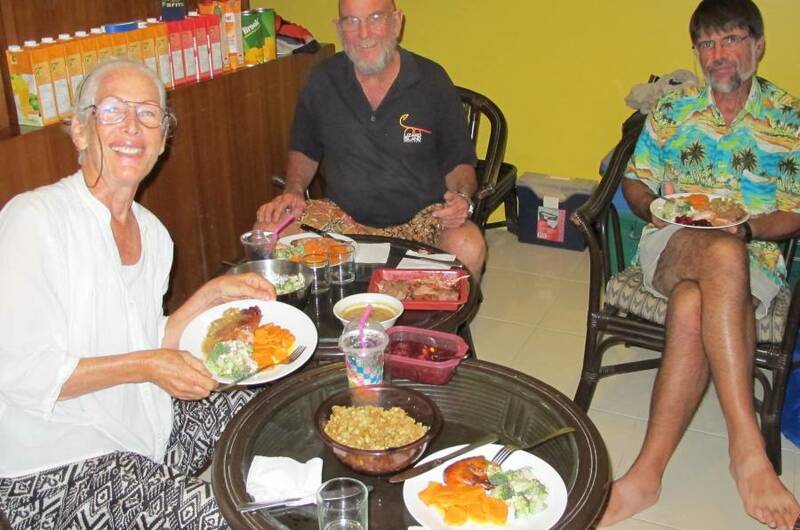 First, of course, we're missing our families - Amanda only just climbed out of the Cambodian highlands. Also, usually we're the boat that hosts Thanksgiving for those (usually US or Canadian) cruisers who wish to celebrate, but we don't really have the means to cook very much. Sue only has a microwave and a hot‑plate at the apartment. 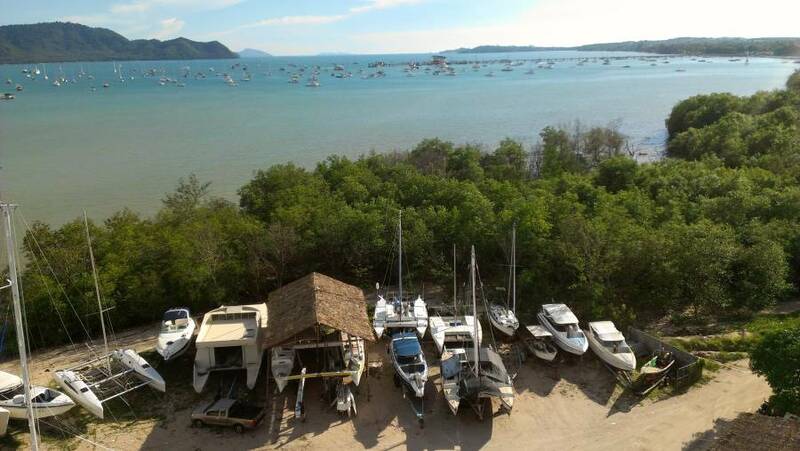 There are at least 2 US boats in the anchorage, but they didn't contact us. But Sue still put on quite a feast, which we shared with our (Aussie) neighbors: Piña Colada starters with roasted pumpkin seed nibblies, roasted chickens garnished with stuffing, turkey gravy, and cranberry relish, yams, and a broccoli, cheese and bacon salad, all washed down with a nice chilled white wine. For dessert she served a pumpkin mousse (pumpkin pie filling, really) on toasted waffles(!) with whipped cream. Full contingent of four back on Ocelot today: Sue, Jon, Houa and Baw, although we arrived a bit late after last nights festivities. But the heavens opened (twice) and we got a real drenching so we couldn't do our planned epoxy work. Houa continued working on the galley cabinet. He cut out the side panels that access the compartment where the sliding companionway door is, and he should be mounting that tomorrow. Baw did an amazing day's work on the bimini bottom. Dressed in long sleeves and a respirator, he sanded and sanded. And sanded! We are beginning to get an idea what a BIG job gelcoating anything is. With the rain, Jon's plans to glass the joint line under the hulls was postponed until a drier day. 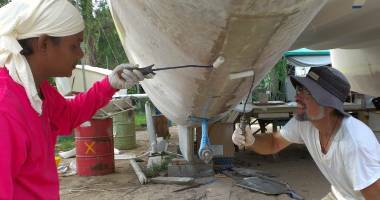 Instead he put in some time polishing the mast so that Sue can do the final wet sanding with 600 and 1000 grit. Once the rain stopped, Sue attacked the mast again. But it will be a few days before she can put more Nyalic on, as the forecast is for rain and more rain. It's interesting to see the difference between where the Nyalic has been put on and where it hasn't. On the Nyalic sections, the water beads up into big blobs. We talked for a long time to Mike from AME Marine. Mike's a Brit who talks even more than Jon does (and that's saying something!) He recently built some molded gelcoat antiskid for some friends of ours, very much like what we want, and stuck it down on their boat (interestingly, also built by Henri Wauquiez, but theirs is a monohull). 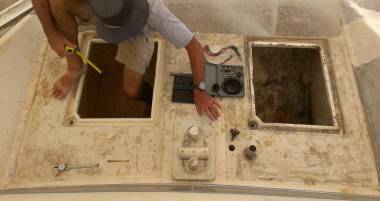 Jon went up to Boat Lagoon to check it out, and the quality of the work was good. Mike is very conscientious and he certainly knows a lot about boats and repairs and gelcoat, but he's also rather expensive. Everyone (including Mike and AME) knows that we've lost a lot of money so they're trying to do what they can for us, but we can't expect them not to make a profit. Mike is working up some quotes for us now. One problem is that AME is based up at Boat Lagoon, which is a good 30 minute drive from Coconuts Boatyard. The biggest job of the day was the glassing of the old joint line where Ocelot's molded hulls are joined together. It's a line running down the center of each hull, but the halves are only joined on the inside. We want to join them on the outside as well. This should reduce hull flex and make the hulls significantly stronger. There's a seam of gelcoat in the crack between the molded sections which Golf wanted to take out, but it's not doing any harm in there and filling that space with epoxy mud wouldn't make the hulls any stronger, so we just left it in. Houa started the day working on the woodwork for the galley, but when Jon asked Houa for a grinder to rough up the joint area, the next thing he knew Houa setup the grinder and was doing the job himself! Now that's service, as it's a nasty job trying to grind up over your head while fiberglass dust covers you. We had some threatening rain clouds all morning and weren't sure about glassing so Jon put in some time polishing the mast, but by 2:30 the sky was clearer and the clouds white. We decided to go for it. 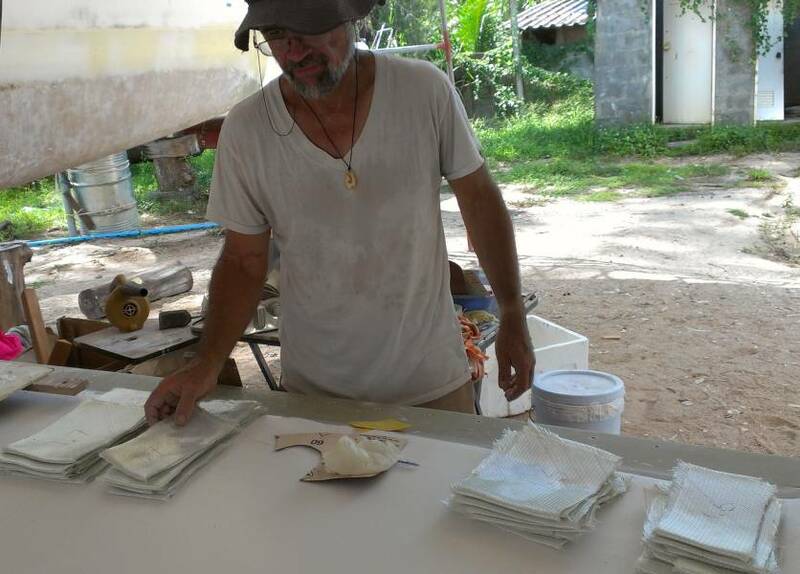 Jon had cut the fiberglass cloth into strips on Thursday. Houa was the epoxy assistant for Jon, and in fact did most of the paddle mudding that proceeded the actual laying of cloth. 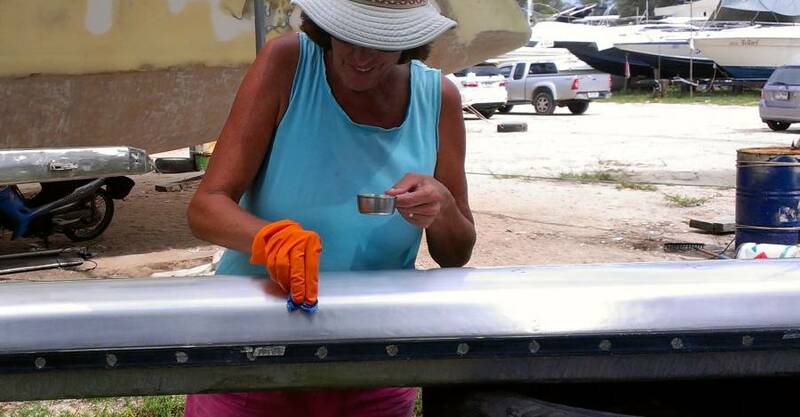 As far as glassing jobs go, it was relatively simple: rough up the fiberglass hull, wipe it down with acetone. Once the acetone had evaporated, the mud and epoxy can be put on, then the long strips of glass which Jon had pre-cut. Jon had the strips of glass all organized and neatly piled up, but at one point Houa started taking strips from the wrong pile and the strips got a bit out of synch, so after that Jon laid all the strips down. By day's end both hulls had a nice glass strip of 2 layers of biaxial from stem to stern (except for under the keels themselves). We finished about 5pm and the evening thunderstorms held off for a few hours so we're hopeful that the epoxy will cure correctly. Baw spent the morning sanding the bimini, but then he told us that his wife's sister had died, so he took the afternoon off. 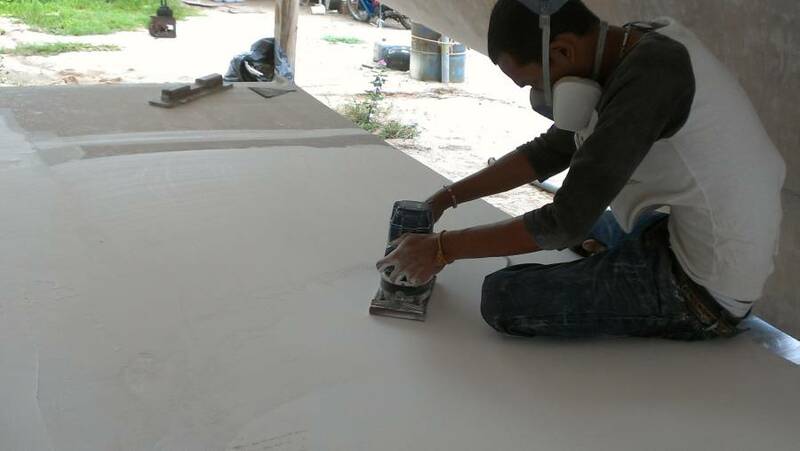 We had initially planned that Baw would help Jon with the fiberglassing, as Houa has other important work to do, but Houa's better English and sunny disposition makes him easier to work with. Sue did a variety of small jobs. She attacked the old helm seat cushion (in the storage room) with vinyl cleaner to see if it would come up nice. It's passable, so we may keep it, but it will need new foam interior, and new zippers. The young woman in South Africa who made the helm seat cushion used aluminum zippers which corroded into nothing. 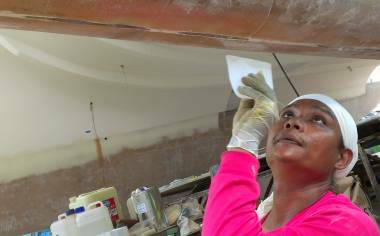 Between sanding/grinding bouts on the hull, Sue applied more of the really gnarly paint remover to isolated nooks on the spars. Once rinsed off, she could use the paint scraper to get a lot of old paint off. She also got in some more time with the 1000 grit paper, spiffing up the mast above the second spreader.